Nepal – A sudden onset of a strong windstorm hit several villages of Bara and Parsa district on 31 March 2019 evening. According to the Ministry of Home Affairs, 27 people lost their lives when they buried under rubble of houses or metal roofs that flew over the settlements. The preliminary rapid assessment report received from affected areas shows that more than 668 people have been injured and more than 2,011 families (Approx. 12,000 people) are affected. Syria – Floods in the north of Syria have affected more than 40,000 displaced people living in refugee camps near the Turkish border, the UN announced yesterday. Heavy rains had caused significant damage to the little infrastructure refugees had. Storms swept away hundreds of tents used by internally displaced families, with rainwater damaging the few goods and possessions they had with them. In some low lying areas, water levels rose to the knee as humanitarian activists attempted to rescue people from the camps and transport them to safety. 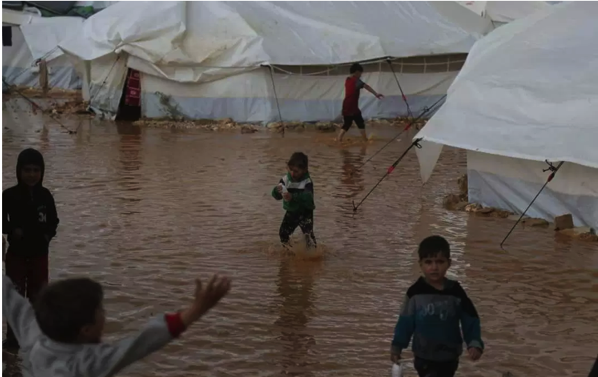 The downpour has affected tens of thousands of civilians, crops and livestock in Idlib, whilst in neighbouring Aleppo a hospital was forced to suspend service due to the rising waters.